It’s been nearly three years since I first encountered Sonarworks’ Reference software, and it has been an essential part of my life ever since. In fact, Reference has even outlasted the Sony headphones that were supplied with the review copy, and which eventually wore out through daily use! For those who haven’t encountered Reference before, it is a system that applies a detailed EQ curve to the output from your DAW in order to compensate for deficiencies in a specific monitoring chain and environment. Compared with other products that do the same thing, however, it has a unique selling point, in that it’s intended to correct the frequency response of headphones as well as loudspeakers. In some ways, correcting headphone frequency response through equalisation is arguably more worthwhile than doing the same with loudspeakers. Problems with speaker-based monitoring are mostly caused by standing waves and other acoustic issues in the room, and while equalisation might improve matters for a single listening position, it can’t properly solve these problems. Nor can EQ address issues that arise from compromises in speaker design, such as port resonance and crossover distortion. By contrast, headphones remove the acoustic environment as a variable in the monitoring chain, so in principle, even a cheap pair of headphones could be equalised to provide a neutral-sounding monitor system as long as it doesn’t suffer from serious distortion or time-domain anomalies — and as long as it’s possible to fathom out what EQ curve to apply! This challenge is a lot more complex than it might appear at first. Headphone listening is intrinsically unnatural, so to start with, it’s not obvious what sort of response we would actually experience as being ‘flat’ or ‘neutral’. Coming up with a meaningful and repeatable measurement of the frequency response of an individual pair of headphones is likewise anything but straightforward, given the complex interactions that take place between drivers, earcups, skull and ears. 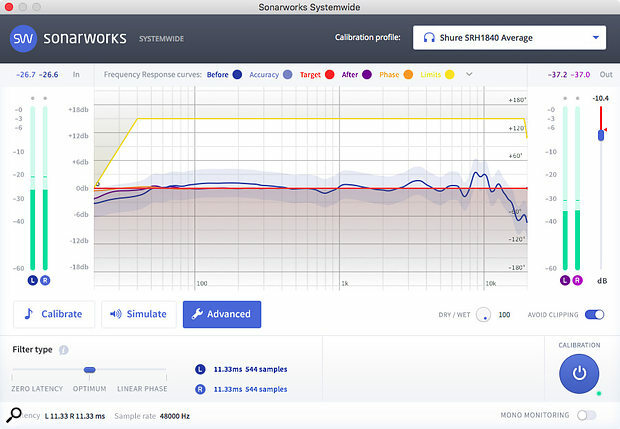 Sonarworks have met this challenge very successfully, and the key factor that makes Reference so useful is their proprietary measurement technique, which really does allow it to compensate for frequency-response variation in a way that we perceive as flat. 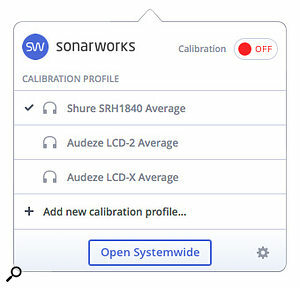 Sonarworks offer the choice of buying Reference with an individual calibration file tailored to a specific pair of headphones; and as they’ve measured more and more individual headphones, so they’ve created more and more averaged calibration files. If you don’t want to send your headphones to Latvia to be measured, you can simply load up the appropriate averaged file for that particular model. When we first covered Reference back in SOS May 2015 (you can read the review online at www.soundonsound.com/reviews/sonarworks-reference-3), version 3 was current and the library of averaged files covered only eight models of headphone. This figure has grown steadily, and with the launch of Reference 4, the subject of this review, the library now stands at 101 models. This tally includes pretty much all the current studio models from major manufacturers such as AKG, Audio-Technica, Beyer, Sennheiser, Shure, Sony and Yamaha, plus a good number from the world of hi-fi — noise-cancelling ’phones have even been measured with noise-cancelling both on and off! The other major change in version 4 is the addition of a zero-latency mode. Whereas the ‘optimum’ setting introduces only a tiny amount of phase shift, and that below 100Hz, the zero-latency mode brings significant phase shift across the spectrum, but does allow you to use Reference whilst tracking. When Sonarworks measure a specific pair of headphones, they say that the resulting correction curve will be accurate to within ±0.9dB, whereas the averaged profiles have an accuracy of ±3dB. The upshot of this is that if you have a good pair of headphones and you only use the averaged curve, the effects of Sonarworks’ correction are not nearly as startling as if you apply an individual profile to cheap headphones. I still felt that Reference 4 made a significant difference to the usability of my Oppo PM-3s, even though the correction curve rarely deviates from the flat by more than 3dB; but with even flatter ‘phones such as my Shure SRH1840s, diminishing returns begin to set in. Ultimately, I do think it’s worth shelling out the extra to have your own pair of phones measured, but unless you’re using neutral open-back headphones costing several hundred pounds, the chances are Reference 4 will still make an appreciable difference even when used with the averaged curves. The cheaper the headphones, the more radical its effect, and in many ways, the brilliant thing about Reference is that it really can convert a sub-£100 pair of ’phones into a genuinely neutral and effective monitoring system. Given that the headphone-only version of Reference retails at well under £100, it’s a bargain. If there’s an area of Reference that perhaps still stands in need of an overhaul, it’s the simulation capabilities. As before, it offers the choice to apply either a neutral frequency response or one derived from a handful of popular playback systems such as Yamaha NS10s, but in contrast to the ever-growing library of headphone correction curves, the number of simulations on offer hasn’t increased at all; nor have Sonarworks explored more adventurous technologies such as crossfeed and HRTF to try to create realistic headphone simulation of speaker listening. Having said that, though, I’d point out that I rarely use the plug-in’s simulation section in any case, and if the reason for its relative neglect is that everyone just prefers to mix on as neutral a system as possible, it’s hard to argue with that! Version 4 represents evolution rather than revolution, then, but even if you already have a custom profile for your main headphones, the potential advantages of the large library of averaged profiles are obvious. Though it pre-dates the v4 upgrade, Systemwide (see box) is another obvious winner, and the zero-latency option will be useful to anyone whose monitoring limitations cause them to struggle with mic placement and such issues during tracking. I used Reference 3 every day, and I can’t offer a higher recommendation for the new version than to say I’m sure I’ll be doing exactly the same with Reference 4. The only directly comparable headphone correction plug-in I know of is Toneboosters’ very affordable Morphit, which offers similar capabilities and an even larger range of supported headphones, but without the option to have calibration tailored to a specific pair. When I reviewed Sonarworks 3, I noted that there are risks and limitations associated with using a plug-in to correct the monitor signal within your DAW. The main risk is that you accidentally leave it active whilst bouncing a mix, thus burning your monitor correction into the signal that everyone will hear; and the main limitation is that monitor correction is not applied to any signal auditioned outside your DAW, so it’s not easy to perform A/B comparisons with material from a media player or streaming service. As mentioned in that review, there are workarounds for this which involve installing a central sound server on your Mac or PC, but this can be clunky and, in my experience, pretty unreliable. So Sonarworks themselves have come up with an alternative called Standalone, which was introduced as an update to Reference 3 and is included in all versions of Reference 4. Standalone is, in essence, a virtual soundcard that sits between your DAW and the driver for your actual soundcard. Once installed, it mostly stays out of your way, with only a little ‘SW•’ logo in the Mac OS menu bar to remind you of its presence. 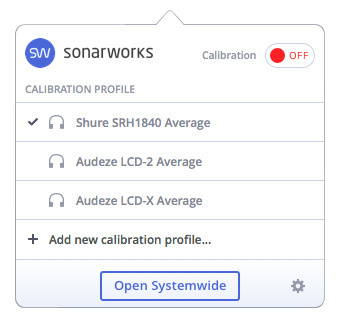 Clicking on this allows you to switch calibration on or off and choose a calibration profile from the three you’ve most recently used. It also gives you the option to open the main Standalone window, which pretty much replicates the functionality available in the plug-in version. Connect a new audio interface, or select a different one in System Preferences, and a friendly dialogue pops up asking whether you want to apply Standalone correction to its outputs, and if so, which ones. In practice, it all seems to work smoothly as long as you’re not trying to mix and match sample rates between applications, which understandably tends to put Standalone into a bit of a sulk so that no sound emerges. Compared with the previous arrangement I had, which involved SoundFlower and Apple’s AU Mixer utility, I also missed the ability to insert other plug-ins into the chain — I found it useful to be able to inspect the monitor signal with a spectrum analyser and equalise it prior to hearing it through Reference. All in all, though, it’s a neat and slick solution to a perennial issue with this sort of software. Now comes with a massive library of averaged responses covering the vast majority of current studio headphones. Standalone version eliminates many of the practical difficulties associated with using monitor correction plug-ins in a DAW. Beyond a certain level of headphone quality, you’ll need individual calibration to make it worthwhile. Options for simulating other monitor environments haven’t been developed further. If you work a lot on headphones and you value a neutral monitoring environment, Sonarworks’ Reference 4 is probably the most cost-effective studio investment you can make. Headphone version €99; upgrade from v3 €19; headphone calibration service €99; Studio Edition including measurement software for speaker correction €249. Prices include VAT. Headphone version $99; upgrade from v3 $19; headphone calibration service $99; Studio Edition including measurement software for speaker correction $249.